Spring is finally here! We're celebrating the arrival of the season with this custom wallpaper installation featuring an assortment of shades of green. The green in the wall mural is provided by rows of plants in the rural farmland. 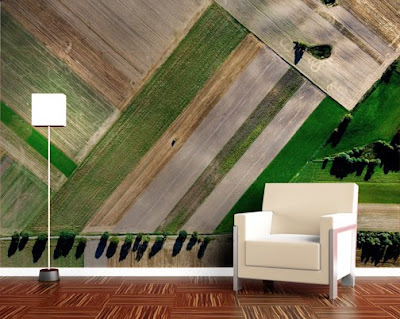 The image is an aerial photograph, an excellent source for wall mural imagery. The budding plots of land create an interesting geometric backdrop for this living space. Aerial shots of cities offer additional geometric alternatives, while aerials of mountains and bodies of water offer softer, less pattern driven murals. Use your own image our check out our image gallery, we can also assist with image research for the perfect custom wall mural.